Please take a look at the indicator PsyLevels_v2 which has ability to plot Bounce and Breakout signals with advanced sound box alerts. greenmilk, dadik, NoctuaFX and 9 others like this. How those levels were calculated? In finance, psychological level, is a price level in technical analysis that significantly affects the price of an underlying security, commodity or a derivative. Typically, the number is something that is "easy to remember," such as a rounded-off number. When a specific security, commodity, or derivative reaches such a price, financial market participants (traders, market makers, brokers, investors, etc.) tend to act on their positions (buy, sell or hold). There are many different ways of looking at support and resistance, with few as compelling as the study of ‘psychological whole numbers'. If you’ve been trading on charts for long enough, you’ve surely noticed the odd behavior that prices will have a tendency to exhibit when a ‘round’ number (prices such as .9900 or .9800 on AUDUSD) is seen. Below is a picture of the Aussie-Dollar’s recent struggle to get over the ‘parity’ level. As you may know, parity is the price of 1.0000 on AUDUSD; or to put it another way – this is when One Australian Dollar is worth One US Dollar. Things get weird at this exchange rate. If someone were to ask you how much you spent on your computer, you’d likely respond with an amount rounded to the nearest hundred (‘ah, about $800,’ or ‘I paid $900.’) Sure, you can give an exact answer like Six-hundred-and-thirty-nine dollars and ninety-six cents; but that doesn’t really make any sense. If I had asked the question, I probably don’t care about the $39.96; I just wanted a ballpark idea for how much you paid for the computer. Out of simplicity, most people (most of the time) will automatically round to the nearest whole number. This happens in trading too. Traders looking to sell the AUDUSD currency pair place a stop at an even 1.0000; not imagining that the price might come into play shortly thereafter. What are the whole numbers? Traders will often call these whole number intervals ‘double-zeros,’ as these prices are at even numbers such as 1.31000 on EURUSD, 1.57000 on GBPUSD or 132.00 on GBPJPY. The chart below will identify the ‘Double-Zero’s’ on the current EURUSD chart. Notice that many of the price swings on the above chart take place around one of these levels. This is why we want to incorporate these levels into our support and resistance studies. This is why these prices can work so well as support and resistance. Because people (traders) watch, and care about these prices. Not every one of these prices are going to function as support or resistance, but enough do that these levels warrant the trader’s attention. Why do Psychological Levels Work? Psychological Support and Resistance often works because of the very fact that we looked at to start this article. As human beings, we value simplicity; we think in whole numbers – and often, when placing stops or limits, we use these prices. Or, more likely, as traders were opening short positions, they set profit targets at an even 1.3000, so that when that price was hit – they had a pending order to ‘buy to cover.’ This profit target order to close their position created demand in the market (they were buying to cover, and this buying interest is considered ‘demand’). After the first inflection, traders may not have been extremely bullish on the prospect of pushing price much lower than 1.3000. After all, this price has already been exhibited as support. In many ways, untested ‘psychological’ levels can be looked at like pivot points. An area where there may be some element of support or resistance, but unfortunately it is impossible to tell until after the fact. In general, round numbers such as 1.30000 on EURUSD or 1.0000 on AUDUSD or USDCAD will garner more attention than a more pedestrian level like 1.31000 on EURUSD; so many traders will often assign a higher degree of strength to the more rounded-intervals. Where traders can really find value with these levels is when prices may have resisted or been supported there in the past. This tells the trader that others are noticing and acting on those prices, and the potential for the ‘self-fulfilling prophecy’ of technical analysis may potentially be considered with more strength. This is Scalping Psy Level Strategy found here. Author - Patrick Bourgeois (the text/description made by author). Indicators are attached. This is a very powerful winning strategy!!! We only use psychological levels to enter our trades. One of the main rules is NEVER TRADE AGAINST THE H1 CANDLE COLOR. Levels are on the screen every 00, 25, 50, 75, 00. Another rule is: If H1 and D1 candle color are the same get ready to make more pips. 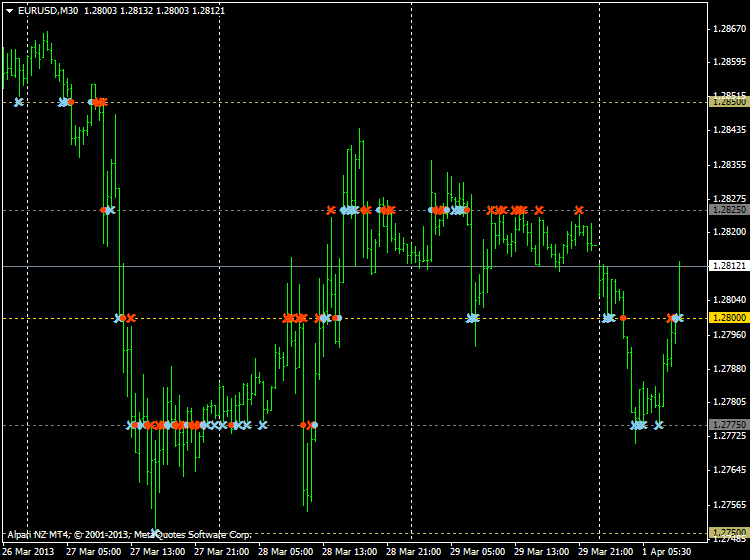 If the colors do not agree be aware that a lot of times you just can grab a few pips (be happy with 5). 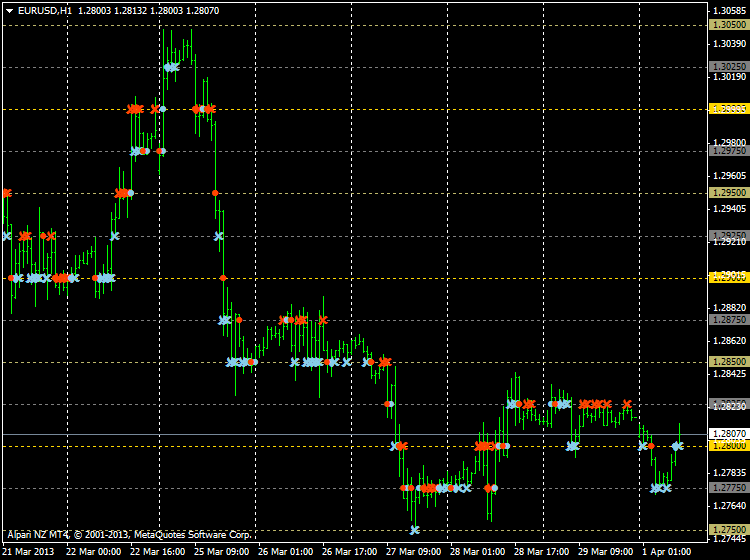 This is a scalping strategy. You are not allowed to enter twice in 1 hour. This is to prevent you from overtrading. Remember you only need 2% a day to get rich in the future all the rest is fun but can be greedy. For MT4 traders i insert my money management rules, the psychological indicator, the 1h candle color overlay and the multi candle color indicator. 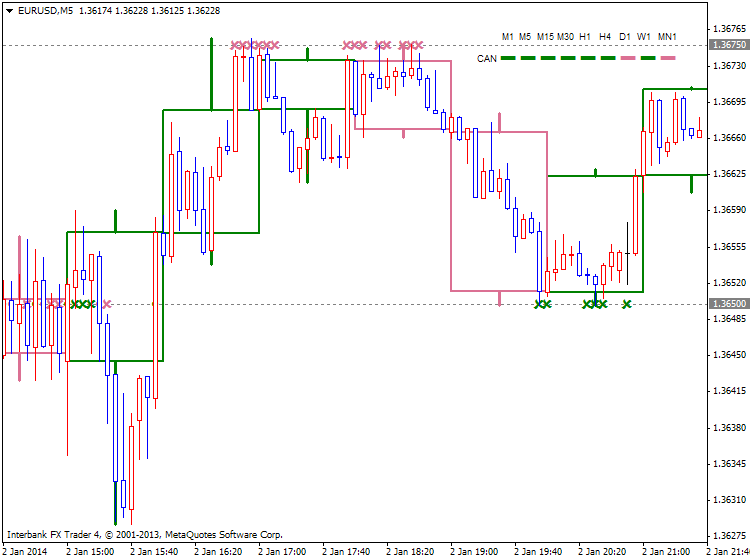 If you like to trade the 5min chart you can see on the same screen what is going on on the higher tmfs. 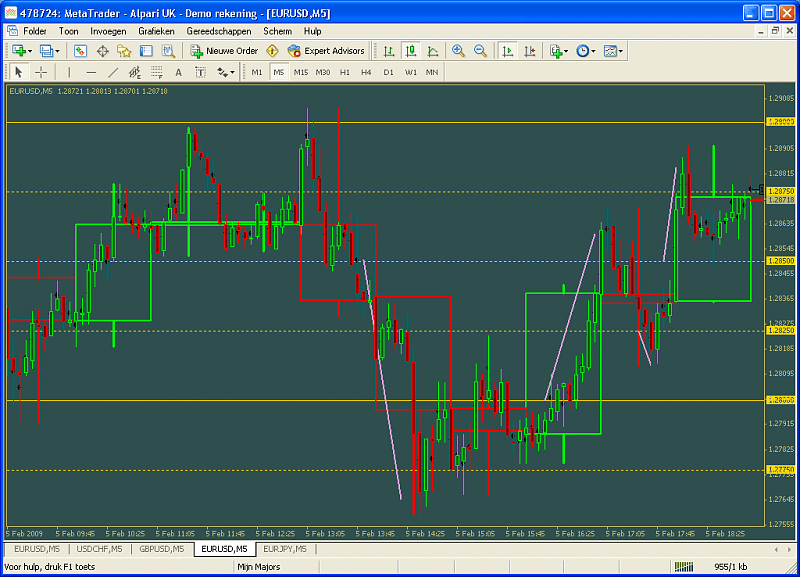 Here is a screenshot from the trading method. The above rules are very important to make it succeed so stick to it. I spoke with Igorad and he told me that it may be good scalping system. But I think - it may be difficult to trade/use it manually so he agrees to create scalping EA for this system on the future (that is why I uploaded it here). 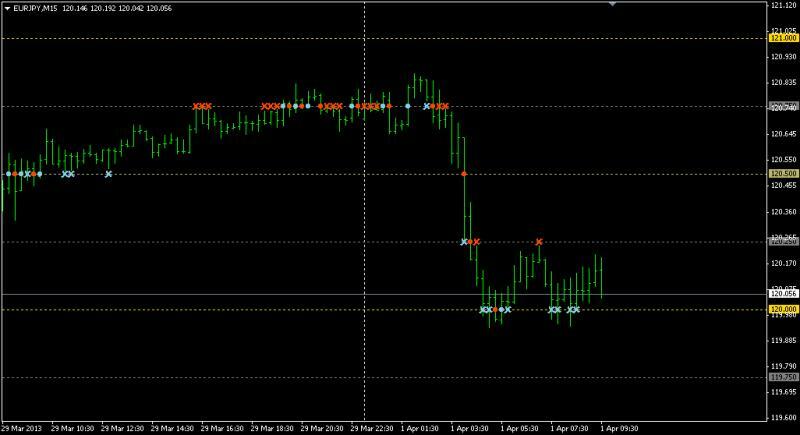 Please check out the Psylevels Dashboard_v1 indicator with ability to watch the breakout and/or bounce levels on any number of currency pairs. Plus you can watch the candle direction on any number of time frames. 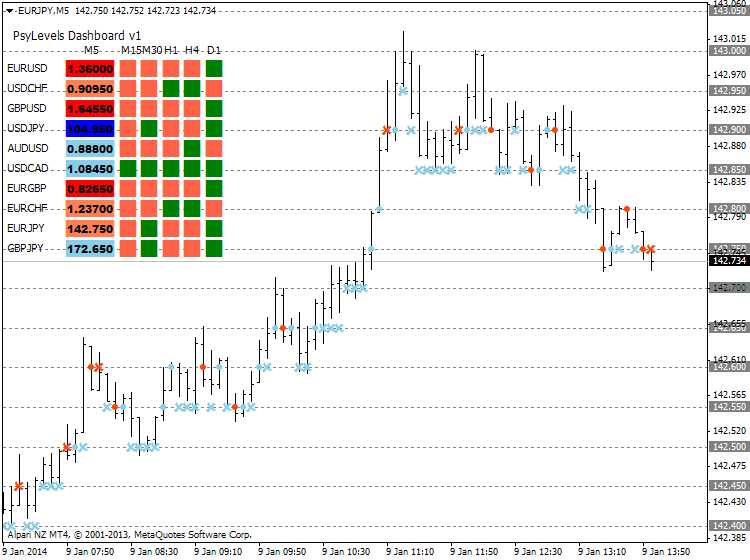 The dashboard also have the popup/email alerts when the breakout/bounce direction matches with all candle directions. newdigital, matfx, puiu288 and 2 others like this. It works - thanks a lot. Templates for white/black background are attached. Royal Knight and Nodp53 like this.